This new scorpion poster features even more images, and for the first time, all scorpions are represented at their actual size! It’s perfect for those who want a clean layout without any distractions, focusing solely on the scorpions sorted by their size and color. This project was a cooperation with the renowned German scorpion breeder Mark Stockmann from Skorpionzucht Stockmann. 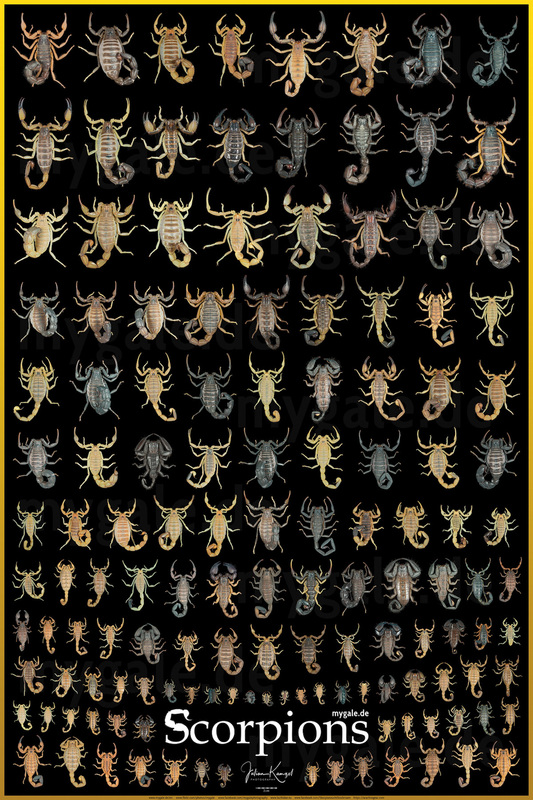 Size: The poster contains almost 140 scorpions from 34 different genera. Resolution: Every single image contains up to 40 megapixels on its own, almost twice as much as regular DSLR deliver. Color accuracy: All scorpion images were photographed in one single session and edited later in the same way on calibrated devices for the most accurate color representation possible. Quality: All images are edited after industry standard with the latest professional hard- and software like Photoshop CC 2018. A technique called „focus stacking“ was used to combine many individual RAW images with different focus areas into one completely sharp image. Scale: For the first time, all the scorpions are presented at their true scale, allowing you to easily see the wide variety of differently sized scorpions, from the smallest Picobuthus wahibaensis to the larger Parabuthus spp. Creating a great-looking layout takes a lot of time, especially with this many images. There are over 1,74*10^41 different ways to sort the images alone! 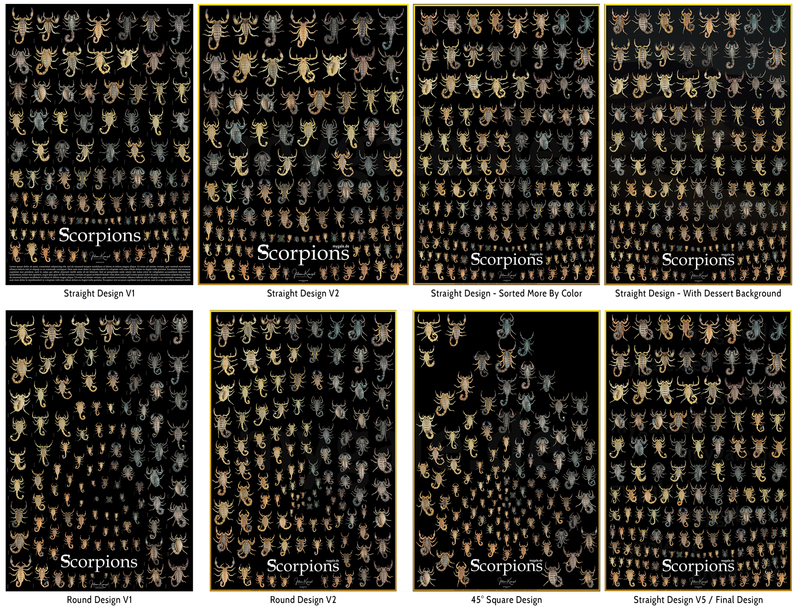 I experimented with different layout approaches to find one that can fit 135-142 images and present them all in an organized way, with all scorpions sorted by color and size. Therefore, I experimented with different aspect ratios, designs with and without texts, w/without background images, and foremost with different shapes: from an ordered straight-lined design to circular one and a 45° square orientated one. All in all, around 10 hours were spent just to work out and refine the different layout approaches.